Visiting Southern California puts you right in the heart of one of the richest brewing communities in the United States. Ranking 1st in the nation in number of breweries (764), California is home to some of the founding breweries of the modern craft beer industry — Sierra Nevada and Anchor Steam then Green Flash and Stone. Despite its link to the earliest days of craft beer and beyond, the area has not been without its mergers and acquisitions. Golden Road joined AB InBev’s High End portfolio, Ballast Point became a Constellation Brand, Lagunitas grabbed a Heineken and Anchor sold to Sapporo. While decisions like those may not always be popular with fellow breweries or beer drinkers, they are still popular locally, with brewpubs and taprooms that fill up right alongside smaller, hipper breweries like Bottle Logic and The Bruery. On a recent visit to Los Angeles and Orange County, I visited some local craft and macro-owned craft breweries and Disneyland. Beer is everywhere. Here are some places I enjoyed. When the San Diego-based craft brewery built on the classic Sculpin IPA began to grow, it needed to grow its funding. If this location is any indication of what is possible by merging with Constellation Brands, Ballast Point has an even brighter future. The result is an indoor and outdoor space that is on point with the brewery’s nautical brand with floor to ceiling windows overlooking a marina. Choose from a selection of flagship beers and special releases within the wood and glass taproom or out on the sprawling patio. I enjoyed their DIPA, Manta Ray, which won gold in Imperial IPAs at the 2017 Great American Beer Festival. Be sure to come hungry with dishes like blackened fish tacos and truffle fries. 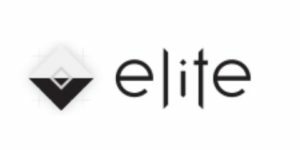 If you’re looking for something trendier. 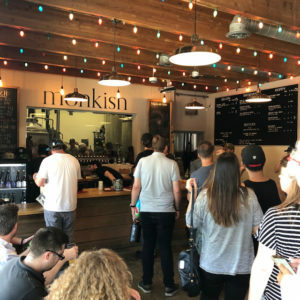 Head about 15 minutes inland from Redondo Beach to Monkish Brewing Company in Torrance. Be sure to check their web site and social accounts before you arrive as the day of your visit might be a can release day. Be ready to wait in line. If they’re releasing one of their limited tall boy can packs, you can expect to line up in a zig-zagging line that is good practice for Disneyland. Once you have your four packs, you can then line up to enter their small taproom where you’ll be able to have your growler filled or enjoy a glass. I happened to visit when they were releasing a collaboration with Richmond’s The Veil Brewing Company — Nighthawkz — a tart, double dry hopped, double IPA brewed with passion fruit, apricot and vanilla. Disneyland. The happiest place on earth. Right? Well, until Disney’s California Adventure opened across the plaza, it was also among the driest places on earth. 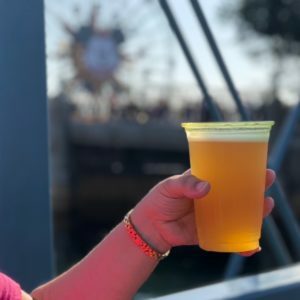 So, while you wander the crowded walkways of Disneyland snacking on your Dole whip or churro, be sure to save room for beer over in California Adventure. Once over there, you can find both craft beer and macros at many of the vendors. But head to Pacific Wharf and the Karl Strauss Brewing Company cart. 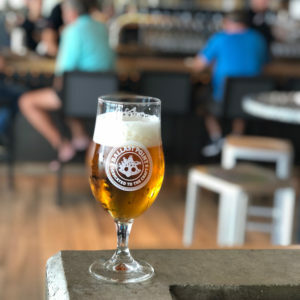 They only serve beers from the venerable San Diego craft brewery, but the options range from wheat beers like Windansea to pilsners like Follow the Sun and their delicious West Coast IPA, Aurora Hoppyalis. Buy one and stroll the park taking in the sights of Cars Land or Pixar Pier. You’ll notice your beer comes in a yellow plastic cup. All beers in the resort go in yellow plastic cups to help “cast members” easily spot cups that have alcohol. Look for other breweries, but count on them being from California. When you’re done with Disneyland — you know, you can’t walk anymore and you’ve nearly lost your voice — go to the nearby Golden Road Brewing Company taproom and pub across from Angels Stadium to recharge. When Golden Road was acquired by the king of macro beers, AB InBev, they had already built a fanbase. Shrewd of AB InBev, to be sure, because not everyone is concerned about who owns their favorite brewery. Among the local beer drinkers I surveyed — drinkers and critics of local and macro breweries alike — this was a place I couldn’t miss. 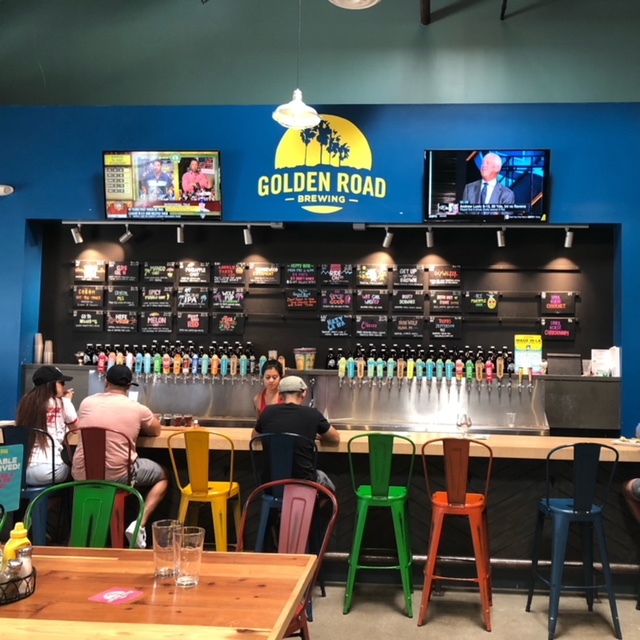 Sure enough, Golden Road’s Anaheim location is big and bright with an indoor tap room and an outdoor beer garden. If you sit inside, you can play table tennis while you wait for your flight. Or sit outside and take in a game of corn hole. I have to be honest, Golden Road might not meet everyone’s definition of craft beer, but their vibe and their delicious beers kind of made that distinction less important. I enjoyed their flagship IPA, Ride On, and Daywalker, a version of their Iron Wolf black IPA brewed with Ethiopian coffee from Portola Lab. My wife’s favorite was their super fruity wheat beer, Mango Cart. Plus, their food is delicious — we enjoyed dishes like duck confit poutine and a generous reuben sandwich. Sometimes it’s great to just enjoy some tasty beers with friends. If, however, you really want support a nano brewery with a mission go to All-American Ale Works. Founded by a group of family and friends that spans generations and includes military veterans, All-American specializes in taking established styles and tweaking them. Do you like a brown ale? Try their Pecan Someone Your Own Size pecan nut brown ale. Like a red ale? Definitely try their Fallen Comrade Red brewed with salt and lemon peel. 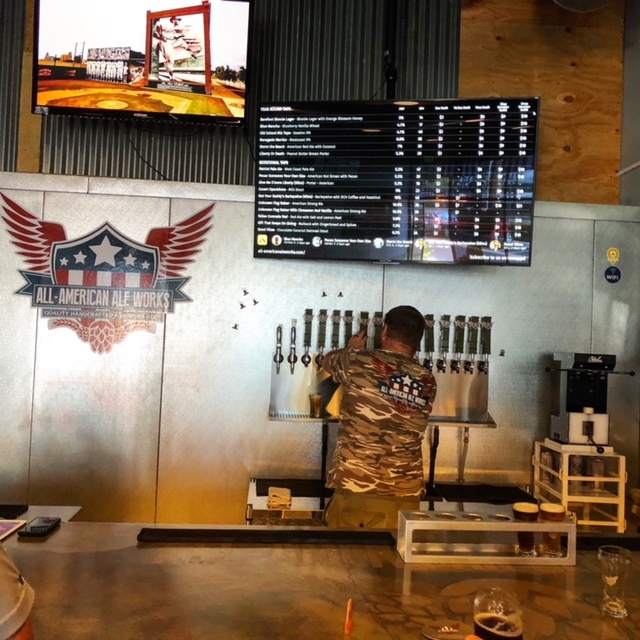 All-American is a three-barrel brewery gaining in popularity with locals for weekly events like Tacos and Trivia Tuesday. I visited on a Tuesday, in fact, and saw folks trickle in ready to chill with fellow craft beer drinkers in their ample tap room. Putting a sleeker spin on the local craft brewery is the last brewery I enjoyed visiting in Orange County. Really just up the road from All-American sits Stereo Brewing Company, a craft brewery with a huge love of music. All kinds. From their name to the concert promo posters on the wall to the records behind the counter to the beer names (all song titles) this love of music is evident. In fact, they regularly hold record swaps in their taproom. While their focus tends to be on hop-forward beers — I enjoyed their limited release hazy IPA called Astral Plane — they also make a variety of other creative beers. Their hazy wheat with ginger, Hazy Jane II, was a delight. And their oatmeal stout, Wall of Sound, won the gold medal in oatmeal stouts at the 2017 Great American Beer Festival. 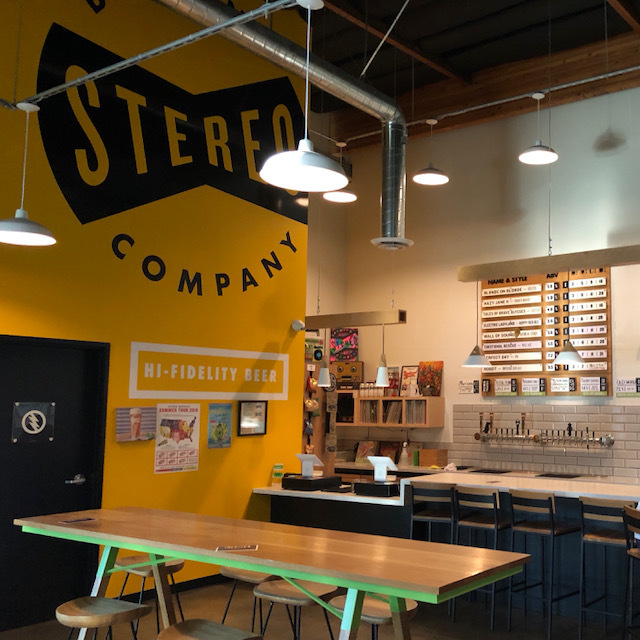 Whether you find yourself sitting in their taproom enjoying a flight, a single pour, or waiting for a crowler fill Stereo sets the stage with great music and beer. They frequently have food trucks set up outside for a bite to eat while you sample their product. There are more breweries in this very large area than most could reasonably visit, even if you lived here. I picked some fun places to grab a beer — places that do what they do well and want you to have a good time. Have fun and share your favorite place to enjoy a beer in Orange County/LA. Join Dominion Wine & Beer on Friday, August 24 from 5-7 p.m. as they host their weekly beer tasting. They’ll be featuring four beers from Ocelot Brewing Company including their brand new collaboration with Triple Crossing Beer, Seek and Destroy DIPA!